Gateway to the Kingdom’s treasures! 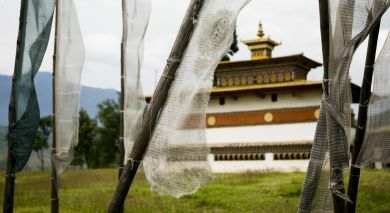 Known as the ‘Land of the Thunder Dragon,’ the charming town of Paro is home to Mt. Chumolhari, some of the oldest monasteries and temples in the region, and the country’s only airport. Rinpung Dzong is venue to the ‘Paro Tschu’ and is one of Bhutan’s strongest fortresses. Amankora lodges have an astonishing effect of genuine harmony of the eco-system & a thriving mosaic of different peoples complimented by the staggering beauty of the landscape amid the supreme greatness of the Himalayan peaks like Jhomolhari! Nestled among glistening conifers, this 24-suite pine forest retreat offers a unique experience. This 29-room eco-friendly hotel on 38-acres atop a tree-clad hill, offers 5-star comfort. The 45 room Zhiwa Ling is a cultural hybrid, a celebration a rich thousand year old culture combined with 21st century innovations. Commanding an enviably pristine location in northern Paro valley, the Nak Sel Hotel & Spa is a new Eco-friendly hotel, evoking a sensual blend of traditional Bhutanese heritage with modernity. The Raven’s Nest in Paro, Bhutan is only a 15-minute drive from the airport. 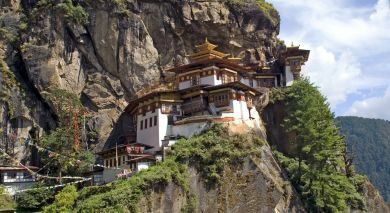 Named after the crown of Bhutan’s Wangchuck Dynasty, visit this hotel for a glimpse into Bhutanese culture. Enjoy a thrilling demonstration of archery or ‘Dha’, the national sport and an activity that most ‘Drukpas’ or Bhutanese archers love to engage in. Every village has its own archery range. Dha facilitates getting together and socializing among players. An ideal weekend or festival sport, it is also keenly popularized by the Kingdom’s Majesty himself. Using bamboo longbows and arrows, the skill, accuracy and artistry of the many traditional archers is spectacular, especially considering the primitive tools involved. The split bamboo bows or ‘zhu’, have twisted stinging nettle strings and lead-tipped bamboo or reed arrows, topped off with bird feather fletches. Large scale compettitions are normally held at Losar (Bhutanese New Year) but smaller competitions are held year round. Enjoy a wide variety of teas, coffees and other beverages along with delectable traditional snacks and pastries amid Bhutan’s tranquil, mountaneous environs. Enjoy an authentic ritual tea ceremony demonstration in Zhiwa Ling’s very own ‘Tea House’. ‘Suha’, the customary Bhutanese Butter Tea will be ceremoniously prepared in front of you, which is made with a special mixture of tea leaves (‘Jare’), salt and yak butter. This is then served with ‘Zaw’, local roasted butter rice or pastries. The in-house monk performs the tea prayers. The wide-ranging tea menu includes Tshering Ma, Green Oolong, Assam, Darjeeling, Chinese Green, India Green, Camomile, Jasmine, Ginger and various Herbal infused Teas. 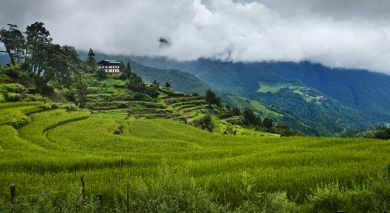 Alternatively, visit a quaint Bhutanese ‘farm house’, built with mud and stones and without the use of single nail. Have some tea/coffee while interacting with the locals, glimpsing typical village lifestyles. Enjoy a thrilling dance performance in a two hour long private session. Bhutanese masked dances reflect highly complex symbolic understandings of life in a complex universe. The Bhutanese see dance as an extension of their religious and social lives because the movement reflects their deep devotion, compassion, tolerance, and harmonious living.